Lowland distillery Kingsbarns’ first casks, filled on 23 March 2015, can now officially be called Scotch whisky after maturing for the required three years and a day. The fledgling Fife distillery will be releasing its first single malt exclusively to its Founders’ Club members in summer 2018. ‘I was very proud to fill this first cask from the spirit I distilled three years ago and am delighted to see the impact that it has had on the colour,’ said Peter Holroyd, distillery manager at Kingsbarns. 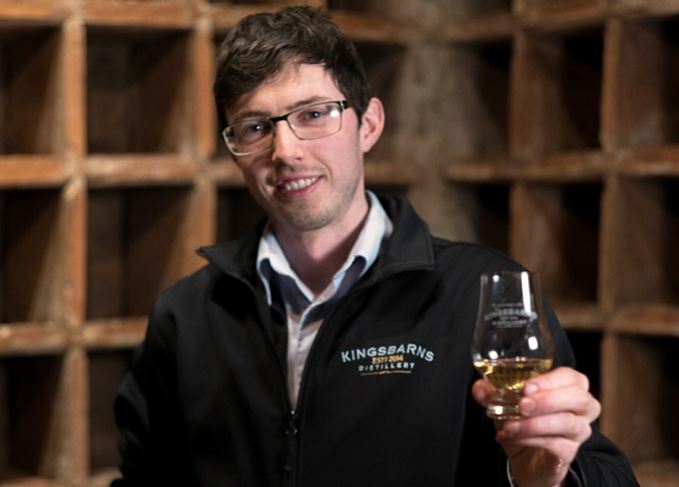 All the casks chosen for the first Kingsbarns single malt were first-fill ex-Bourbon barrels from Heaven Hill distillery in Kentucky, imparting ‘a wonderful balance of spirit and wood’, according to Holroyd. ‘On the nose I get custard and apricot Danish pastry, but you still get the Kingsbarns light, fruity character,’ he said. The first cask filled with new make spirit in 2015 was also the first cask tapped and sampled by Holroyd, and it will be on display at the distillery’s visitor centre in Fife. Unlike the rest of the casks filled by Kingsbarns distillery, this cask will never be considered Scotch whisky, as it has been housed in the visitor centre rather than a bonded warehouse. ‘Now that we have reached the minimum legal age, we can move forwards to sample whisky from our early casks and make some choices regarding the first bottling of our new Lowland malt,’ said William Wemyss, on behalf of owner the Wemyss family. Although the first whisky produced by the distillery will be released this year, some of its stock has already been bottled and sold: one year ago, Kingsbarns released its two-year-old spirit as a ‘Spirit Drink’, bottled at a cask strength of 62.8% abv.